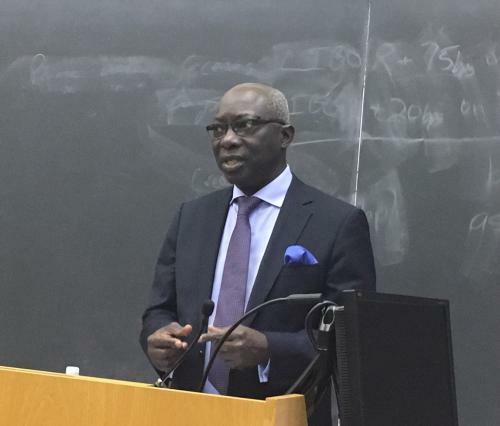 On Wednesday, April 25, Adama Dieng, Assistant Secretary General at the United Nations and Special Advisor to the Secretary General on Genocide Prevention, delivered the Charles E. Scheidt Family Fund lecture on prevention to a group of students at Yale University. Mr. Dieng’s lecture, titled ”Preventing Genocide and Crimes Against Humanity: Future Challenges and Opportunities”, addressed the genesis of the contemporary atrocity prevention regime, the political challenges facing that regime within the UN system, and the prospects for finding ways to confront atrocity risks (and ongoing atrocities already unfolding) in countries like Burundi, Central African Republic, Myanmar, South Sudan, and Syria. Questions from the audience mostly focused on these cases, leading to an extended discussion about the toolkit available for atrocity prevention, and the appropriate times and means to use it.